Located in Reykjavík 101, this hotel is steps from Einar Jonsson Museum and Hallgrimskirkja. Laugavegur and Reykjavik City Hall are also within 15 minutes. If you're looking for a great (and cheap!) hotel in Reykjavik, CheapTickets is the best place to find them. We offer deals on the best 186 hotels throughout Reykjavik. No matter what you're looking for, we have options for you. Grab great rates on the 90 affordable 3-star hotels that are easy on the wallet without sacrificing comfort. Looking for more luxury? Try one of the 38, 4-star hotel accommodations in Reykjavik. No matter your budget needs, we've pulled out all the stops to make sure you have plenty of vacation options. Maybe you prefer to search for your hotel deals based on what each hotel offers? For example, let's say you just want to find a hotel or resort that has a pool to cool off in after a long day exploring Reykjavik. Scroll down to choose from the 32 hotels in Reykjavik that has a pool for guests. 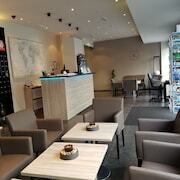 Or search for deals on Reykjavik hotels offering free wifi or breakfast, non-smoking rooms, and more! CheapTickets is here to be your personal travel agent for your next trip to Reykjavik. Get booking today! What hotels in Reykjavik offer free wifi access? Are there deals on Reykjavik hotels offering free breakfast? Yes! The only thing better than finding a great deal on a cheap hotel in Reykjavik is finding one that offers free breakfast. Grab some eggs, a waffle, or some healthy oatmeal before a day full of exploring Reykjavik and all that it has to offer. Below are just some of the many hotels that offer free breakfast in Reykjavik. 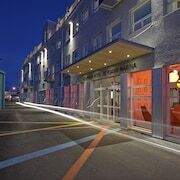 Storm Hotel by Keahotels is a 3.00 star rated hotel property in Reykjavik that offers free breakfast. Hotel Leifur Eiriksson is a 3.00 star rated hotel property in Reykjavik that offers free breakfast. 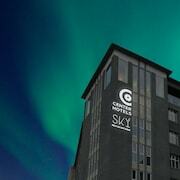 Hotel Reykjavik Centrum is a 4.00 star rated hotel property in Reykjavik that offers free breakfast. 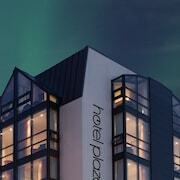 Fosshotel Reykjavik is a 4.00 star rated hotel property in Reykjavik that offers free breakfast. What about deals on pet-friendly hotels in Reykjavik? Reykjavik is a great place to get outside and explore with your pets in tow so don't leave your furry friends behind. Below you'll find great deals on hotels in Reykjavik that allow pets. Don't forget to bring plenty of treats! Radisson Blu 1919 Hotel- Reykjavik is a popular, pet-friendly, 4.00 star hotel in Reykjavik. 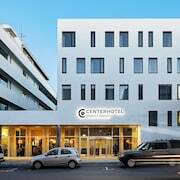 CenterHotel Arnarhvoll is a popular, pet-friendly, 3.50 star hotel in Reykjavik. Black Pearl is a popular, pet-friendly, 4.50 star hotel in Reykjavik. Stay Apartments Einholt is a popular, pet-friendly, 3.00 star hotel in Reykjavik. Any good rates on Reykjavik hotels with restaurants? Absolutely. Don't want to deal with planning our all your meals on your trip to Reykjavik? We don't blame you. Keep the hangry away by staying in one of the 36 hotels that have restaurants. With a room at one of these spots, all it takes to get a good meal is hopping in the elevator. Check out some of the most popular hotels in Reykjavik that have restaurants below. Book Icelandair Hotel Reykjavik NaturaIcelandair Hotel Reykjavik Natura is a 4.00 star hotel and has one or more restaurant options. Book Apotek Hotel by KeahotelsApotek Hotel by Keahotels is a 4.00 star hotel and has one or more restaurant options. Book Hotel VellirHotel Vellir is a 3.00 star hotel and has one or more restaurant options. Book Northern Light InnNorthern Light Inn is a 3.00 star hotel and has one or more restaurant options. What are the cheapest hotels in Reykjavik with pools? What's better after a long day exploring Reykjavik then a relaxing dip in a pool? Finding the Reykjavik hotel you need for a bargain! Cool off and unwind at one of our 32 Reykjavik hotels with a pool. Browse some of the top deals on these hotels and resorts with pools in Reykjavik below, but be warned: You may not want to check out! 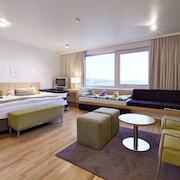 Radisson Blu Saga Hotel- Reykjavik has a pool and a 4.00 star rating. Hotel Holt has a pool and a 4.00 star rating. CenterHotel Thingholt has a pool and a 4.00 star rating. Iceland Comfort Apartments has a pool and a 2.50 star rating. What hotels in Reykjavik offer parking for guests? Once you've made your way to Reykjavik, the last thing you want to deal with is finding parking close to your hotel. Avoid the hassle of parking around the block and carrying your luggage all the way to the lobby by booking one of our hotels with parking. Check out deals on some of the 101 hotels in Reykjavik that offer parking for guests. Hotel Borg by Keahotels This hotel has a 4.00-star rating. Stay Apartments Bolholt This hotel has a 2.50-star rating. Castle House & Embassy Luxury Apartments This hotel has a 3.00-star rating. CenterHotel Klopp This hotel has a 3.00-star rating. Do Reykjavik hotels offer 24-hour concierge services? When you're on vacation, things don't always go according to plan. Travel with peace of mind when you book one of our 34 hotels in Reykjavik with 24-hour concierge service. That way you know help is always phone call or elevator ride away. Try Canopy by Hilton Reykjavik City Centre. It's a 4.00 star rated hotel in Reykjavik that offers concierge services 24 hours a day. Try Skuggi Hotel by Keahotels. It's a 3.00 star rated hotel in Reykjavik that offers concierge services 24 hours a day. Try Hotel Vellir. It's a 3.00 star rated hotel in Reykjavik that offers concierge services 24 hours a day. Try Reykjavik Residence Suites. It's a 3.50 star rated hotel in Reykjavik that offers concierge services 24 hours a day. What about low rates on non-smoking hotels in Reykjavik? Hotel Fron This hotel has a 3.00-star rating. Room With A View - Apartment Hotel This hotel has a 4.00-star rating. Hotel Laxnes This hotel has a 3.00-star rating. Reykjavik4you Apartments This hotel has a 3.50-star rating. What are the cheapest Reykjavik 3-star hotel deals? Our 3-star hotels bring you quality accommodations at a lower price point for the perfect, budget-friendly vacation in Reykjavik. With 90 3-star hotels throughout Reykjavik to choose from, you still have options. Browse our selection below. Reykjavik4you Apartments. Located in the heart of Reykjavik, this apartment is within a 10-minute walk of Asgrimur Jonsson Collection, Hallgrimskirkja, and Reykjavik City Hall. National Museum of Iceland and Perlan are also within 2 mi (3 km). CenterHotel Midgardur. Situated in Reykjavik, this hotel is within a 15-minute walk of Sundhollin and Hallgrimskirkja. Reykjavik City Hall and Perlan are also within 1 mi (2 km). Luna Apartments. Located in the heart of Reykjavik, this apartment is within a 10-minute walk of Asgrimur Jonsson Collection, Hallgrimskirkja, and Reykjavik City Hall. National Museum of Iceland and Perlan are also within 2 mi (3 km). What are the best deals on 4-Star Hotels in Reykjavik? Reykjavik is full of hotels and it can be hard to narrow down where you really want to stay. Luckily, we've done that hard work for you be narrowing you from 186 hotels throughout Reykjavik, to the 38 4-star hotels in Reykjavik. Our 4-star hotels in Reykjavik are exactly what you need for your next family trip, romantic weekend, or solo getaway. Check out our most popular deals below. 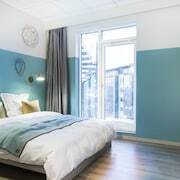 CenterHotel Thingholt: Housed in a renovated printing factory, this boutique hotel is located in downtown Reykjavik, 20 metres from the main shopping area and 50 metres from the Icelandic National Theatre. Alda Hotel Reykjavik: Located in the heart of Reykjavik, this hotel is within a 10-minute walk of Sundhollin and Hallgrimskirkja. 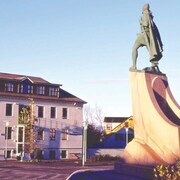 Reykjavik City Hall and National Museum of Iceland are also within 1 mi (2 km). Room With A View - Apartment Hotel: Located in the heart of Reykjavik, this apartment is within a 10-minute walk of Asgrimur Jonsson Collection, Hallgrimskirkja, and Reykjavik City Hall. National Museum of Iceland and Perlan are also within 2 mi (3 km). 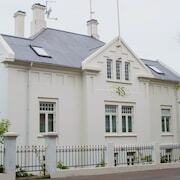 Hotel Borg by Keahotels: This gracious 1930s hotel is located in the beaufiful square of Austurvollur, in the heart of Reykjavik and across from Althingi, the Icelandic parliament and the cathedral. What are the best activities to do in Reykjavik? Half-Day Whale-Watching Cruise in Faxaflói Bay: Starting at just $100 per person. Sea Angling Boat Trip & Fish Grill: Starting at just $122 per person. Golden Circle Express Tour: Starting at just $64 per person. Super Jeep & Snowmobile Tour of the Golden Circle: Starting at just $441 per person. Beautiful little hotel. 1930's centrally located to shopping and food. Walkable distance to so much. We love our trip. The people of Iceland are awesome! Loved the lady that worked in the morning. She was very helpful with recommendations and very friendly. It was close to everything and breakfast each morning was great!